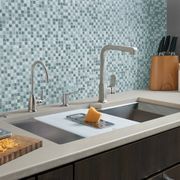 The apron front sink style is one of the most popular sink options in kitchen design. 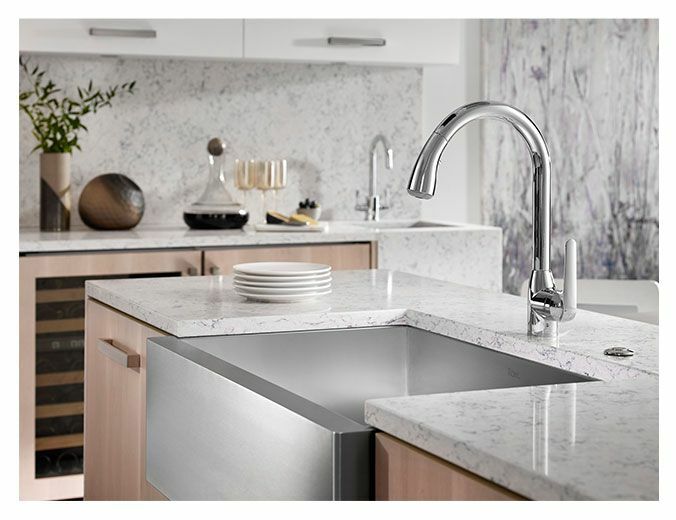 With its deep basin and wide “apron” panel that juts out slightly from the surrounding cabinetry, the apron front sink is meant to be a dramatic focal point in the kitchen. 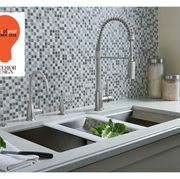 Often seen in white fireclay, the ROHL Luxury Stainless Steel Apron Front Kitchen Sink adds a contemporary/industrial edge to any kitchen design. It is constructed of 16 gauge commercial grade 18/10 type 304 stainless steel for extreme durability, with lasting shine. It is crafted with a unique Tangent Edge™, zero-edge side walls and a rounded bottom edge radius, making it both easy to clean and long-lasting. An insulated undercoat – Quiet Coat™ – covers the entire surface and therefore reduces sound. 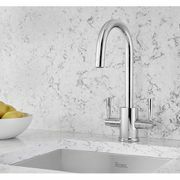 The deep basin, combined with the commercial grade stainless steel, makes this sink a sturdy workhorse for any culinary connoisseur. It's large enough to accommodate stock pots and baking sheets, deep enough to reduce spills and because of its unique finish, is easy to clean.